"How much fabric will I need to make these quilt blocks?" "What would they look like in a quilt layout?" 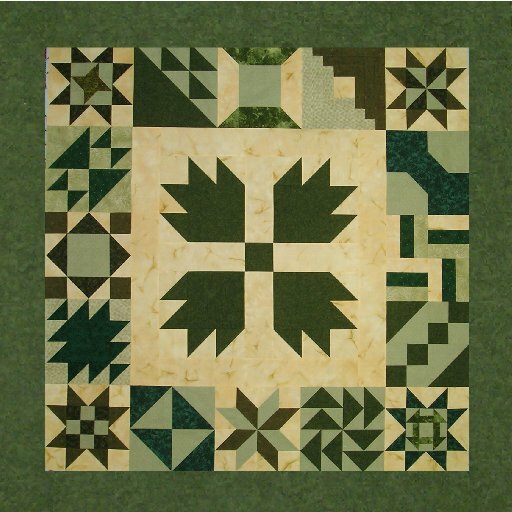 BlockFab will help you answer these questions for some traditional blocks in a variety of well-known quilt layouts. BlockFab is not a quilt design app. However, it will let you quickly see the results of various design, color, and layout possibilities. And if you already have a pattern you like but you want to customize it by changing the size or number of blocks or by adding a pieced border, BlockFab will calculate the fabric required. Choose from a small library of grid-based blocks, or from a library of commonly-used patch shapes. Then choose the number and size of blocks or patches. BlockFab will determine the amount of fabric you need to buy, and will give you some hints on cutting out the blocks or patches, based on the cutting assumptions used for calculating the fabric needed. Both English and metric units of measure are supported. Not ready to make those blocks, but just want to dream and plan? You can play around with the blocks in sample layouts while varying colorways, layout styles, number of blocks, and pairing of blocks. With just a flick, tap, pinch, or twist, you can view thousands of variations. Simply follow the blue arrows. 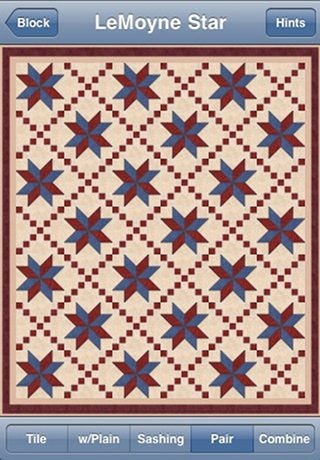 You can mail a copy of the yardage needs so you will have a record of the fabric for this set of blocks. When you leave the application, your latest block and fabric choices will be saved, and this information will appear the next time you use the application. 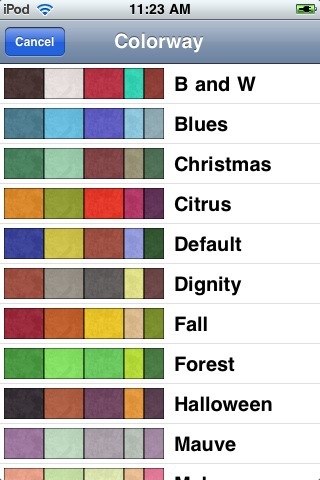 Thus you can customize BlockFab to use your own preferred fabric and quilting methods. Block tab: On this tab, located at the bottom of the screen, you can choose a block by going to the library via the Library button. 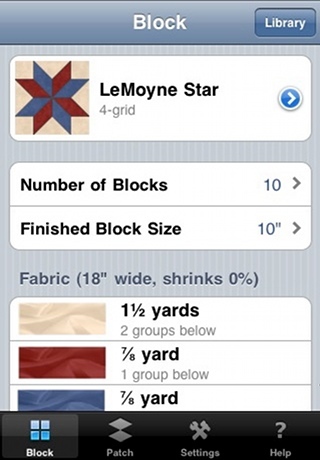 This is also the main block screen from which you can see the fabric needed based on your block, count, and size choices. 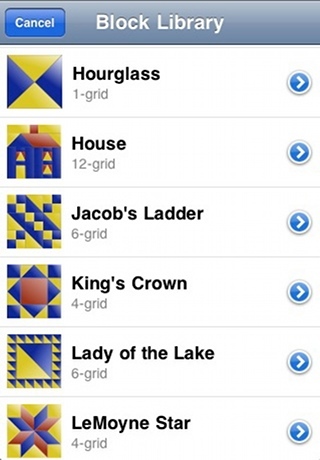 Or tap the blue arrow next to the block to view some sample quilt layouts using this block. Block count and size: tap on these numbers to go to the pickers to choose the number of blocks and the finished size of the block. For convenience, you can enter the size in either inches or centimeters, but the number will be converted to the current unit of measure, as defined in the Settings tab. 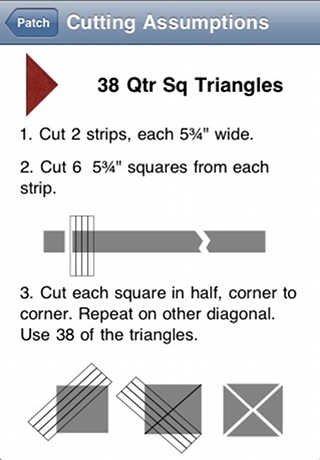 Cutting assumptions: There are numerous ways for quilters to cut patches and blocks. BlockFab computes fabric needs based on using strips. Tap on the cutting assumptions for a particular unit to see further hints on how to cut the strips. Patch tab: This tab is similar to the Block tab, except it handles common individual patch shapes. This is useful if you are making pieced borders, or if the block you are interested in is not in the block library. As with the Block tab, you can choose from a library of patches commonly used by quilters, and choose the number and size of the patches. The fabric needed and the cutting assumptions are also given. 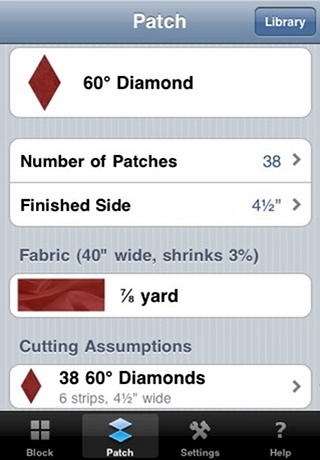 Settings tab: On this tab, you can choose a colorway for viewing the blocks, fabric characteristics, English or Metric units of measure, a default email address for sending results via email, and right- or left-handed cutting guidelines. Fabric characteristics: Quilt fabric typically comes in a nominal 42" width, but it is safer to assume that 40" of that is usable. The cut end of the fabric is often not straight with respect to the selvage edge, so a couple inches can be lost when straightening it. Cotton fabric usually shrinks 3% to 5% (lengthwise) when washed, although flannels and other fibers may shrink more or less. If you do not prewash the fabric, shrinkage is not a factor. 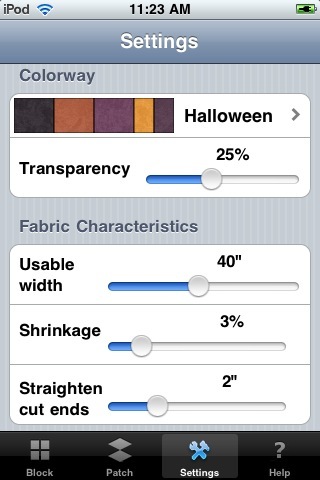 Fabric Width Tip: What should you do if your fabric is wider than the range of width choices? Because the strip cutting method is used, the wider the fabric, the more potential waste of unused partial strips. So if your fabric is very wide, one strategy is to specify a fabric width half as wide as the actual fabric, and buy half the fabric listed. Then adjust the number of strips accordingly. Photo Tip: You can save screenshots at any time. Press and hold the "Home" button followed by pressing the "Sleep/Wake button" once. When the screen flashes and a camera shutter sound plays, release the "Home" button. Locate the screenshot in your iPhone's camera roll or iPod's saved photos and send the image through email. Pinch Tip: When using a pinch on a quilt layout, a small pinch in or out will change the scale by one block, whereas a large pinch will scale the quilt all the way up or down. A quick pinch works best. Pinches also work best in the diagonal direction, so that if you set down or lift up one finger before the other, it isn't mistaken for a flick. If you have long nails, try pinching with the sides of your fingers. Flick Tip: A flick should be quick, with the single finger landing and taking off quickly, but traveling far enough in the horizontal or vertical direction to be an unmistakable flick. Flicking gestures must be done quickly to distinguish them from taps or dragging gestures. Apple, iPad, iPhone, and iPod touch are trademarks of Apple Inc., registered in the U.S. and other countries.